This is an ideal use for courgettes when they are in season and plentiful (June - September). 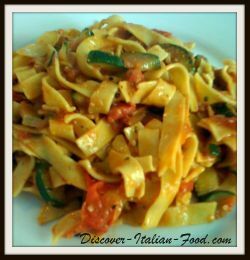 It is best made with fresh homemade tagliatelle rather than the dried variety. I think the addition of the cherry tomato sauce really brings this dish together but it can of course be made without it. The sauce should take no longer than about 10-15 minutes. You could make the same dish using aubergines as an alternative to courgettes. If you also then used salted ricotta instead of parmasan you would be making Tagliatelle alla Norma (a classic Sicillian summer pasta sauce whose name is believed to come from Vincenzo Bellini's "Norma"). The courgette should be sliced length ways in half then each half should be sliced again length ways. Each of the four strips of courgette should then be cut into slices. Gently fry the slices of courgette in a pan with olive oil and season with salt and pepper. Once the courgette slices are cooked add the cherry tomato sauce and heat through. Heat a pan of salted water for the pasta and add the tagliatelle when the water starts to boil. fresh pasta should only take a few minutes to cook. Drain the pasta once it is al dente and add to the pan with the courgette and tomato sauce. Reserve some of the water used to cook the pasta. Mix and coat the pasta with the courgette and tomato sauce in the pan and if the sauce needs it, add a little of the reserved cooking water. Finally add chopped basil before serving. Serve in with a sprinkling of Parmesan and some black pepper to taste. It can be served as a meal in its own right or as a pasta accompaniment to some grilled meat / fish.